If you are a high-octane mechanical menace, there are few brands in the world that speak to your essence as does Monster Energy. That three clawed jolt of internal electricty is enough to get anyone’s engine cranked. With that mental state in mind, HJC has released two new graphics in it premier helmet, the RPHA-10. Pulling from the night and the curiosities of mystery, the HJC RPHA 10 Ghost Fuera Helmet is out to wreak havoc on the night. With the wisp of white adorning the top of the faceshield jaggedly streaking to the back of the lid, the illusion of motion is created even when the helmet is sitting still. 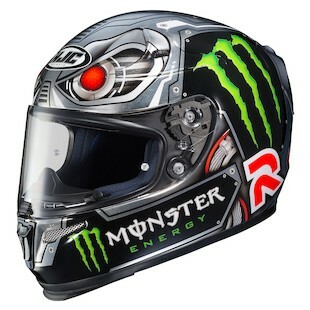 While riding around the town in a helmet built to the quality specifications of racing elites such as Jorge Lorenzo, you can throw on the Monster themed graphic of the Ghost Fuera and express your own unique style out on the road. 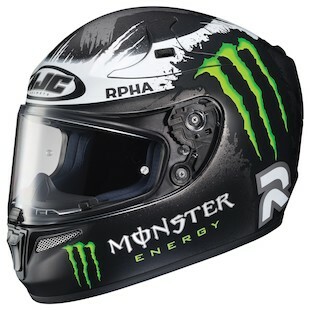 Another new graphic in the lineup is the HJC RPHA 10 Speed Machine Helmet. This is a helmet from the 22nd Century. The Terminator theme is unmistakable in this lid as the red eyes of the ultimate hunter peer out from above the faceshield. Moving throughout, the mechanical theme extends to the back and surrounds the spartan emblem that resides in the middle of the back of the helmet. With a 5 year warranty, DOT and Snell safety approval, and Pinlock shield with insert included, there is a lot to like about this new addition to the HJC line. Sometimes solid colored helmets won’t do. Just as some of us prefer a drink with a little more kick, so do do others choose to wear a helmet that is a little more energetic. For times like this, let Monster do what it does best and go with the RPHA 10 Ghost Guera and RPHA 10 and RPHA-10 Speed Machine.